WalMart.com has some special buys, clearance and limited qty items. Fisher-Price - Time to Sleep 900 MHz Baby Monitor, Dual Receivers is $46.77. Evenflo - Discovery 5 Infant Car Seat, Jungle Puzzle, $49. Evenflo - Zing Discovery Travel System, car seat and stroller, Georgia Stripe, $135. Walmart.com now this highly rated Doc McStuffins Pet Vet Checkup Center for only $29.87 (regularly $64.99). Choose free in-store pick up. This pretend play vet center includes a scale, electronic stethoscope, water sprayer, pet Findo and more! Patients can even get a treat from the pet treat dispenser after their checkup. How cute is that?! Walmart.com now you can buy this Mainstays 5-Piece Dining Set for $109.97 shipped. Even better, if you prefer the deep walnut color, you can save an additional $3.30 when you choose to pick this item up at your local store which makes for a final cost of $106.67! This table has a steel frame with a wood top as well as four metal chairs that have upholstered seats. Its compact size makes it a great option for a smaller area like a kitchen nook. Walmart.com now you can get this highly rated Little Tikes TotSports Easy Hit Golf Set for just $11.76 when you choose free in-store pick up. This set includes an easy-rolling pull cart, a driver, a putter and three balls. Walmart.com get this Star Wars Smart R2-D2 (comes with 4 with Duracell Coppertop AA Alkaline Batteries) for just $34.99 – regularly $90! This Smart R2-D2 has app-controlled movement in all directions. He plays games, dances to music, and makes authentic droid sounds. Walmart.com now get this Landmann USA Big Sky Steel Wildlife Fire Ring for only $8.44 when you choose in store pick up. If you prefer to shop from Amazon, you can get this same ring for just $8.61. Get free shipping on a $25 order OR free 2-day shipping on ANY size order with Amazon Prime. This ring is ideal to keep campfires contained while still providing a 360 degree view of the fire. Plus, it’s easy to assemble and features fun animal cutouts! Walmart.com now you can get either this Disney Finding Dory Room-in-a-Box or this Disney Frozen Room-in-a-Box for just $75 shipped (regularly up to $129.96)! Each box includes a toddler bed, toy organizer, art desk with chair and a bonus director’s chair! Walmart.com now you can get this Rubbermaid Easy Find Lids 28-Piece Food Storage Set for only $8.51 (regularly $21.83). Choose free in-store pick up. This set includes two 0.5 cups, two 1.25 cups, two 2 cups, two 3 cups, two 5 cups, two 7 cups and 2 bonus 0.5 cups. Plus, all lids are included! Walmart.com now you can get this WowWee Lumi Gaming Drone for just $19.96 – regularly $64.25! Free in-store pick up. This easy-to-fly drone is designed for ages 8 and up. The Lumi gaming drone allows kids to play fun, interactive games with this unique flying quad copter, while avoiding objects in your home. The downloadable app turns your smart phone or tablet into a remote control, with easy-flight technology putting emphasis on fun, games and music rather than struggling to keep the drone airborne. Walmart now you can get this Kid Trax Disney Moana 6V Battery-Operated Quad Ride-On for just $39 shipped – regularly $79! This ride-on includes a 6V rechargeable battery and wall charger, and is designed for toddlers 18 months and older and less than 40 pounds. Walmart.com now get this Disney Junior Doc McStuffins Toy Hospital Checkup Center for only $28.68 (regularly $64.99)! Kids can slide in multiple play x-rays to activate lights and sounds, use the scale to weigh animals with a removable basket, and give them a bath with a pretend water sprayer. Plus, this center comes with an electronic stethoscope, kid-powered EKG, otoscope, play thermometer, and brush and bandage sticker dispenser! Walmart.com now you can get this First Act Marvel Avengers Keyboard for just $11.70 after you choose free in-store pickup at checkout! You can also get this First Act Disney Finding Dory Keyboard for just $11.99 (no pick-up discount for this item). These keyboards have 37 keys, 16 key voices, echo sound effects, 20 rhythms and 24 demo songs. Kids can control the volume and tempo while they record an original song. Walmart.com now get this Hamilton Beach 2 Liter Professional Deep Fryer on sale for just $19.88 (regularly $34.96) – choose from red or black! This deep fryer features an 8-cup oil capacity with adjustable heat settings. Food can be lowered and lifted without opening the lid for splatter-free frying and it can cook up to 5 servings of fries or onion rings at a time. Walmart.com now you can get this EastPoint Sports 87″ Brighton Billiard Pool Table in green for just $250 (regularly $399.99). This pool table features traditional claw foot legs that are scratch resistant and comes with 2 wooden billiard cue sticks, a set of 16 billiard balls, 2 billiard chalk cubes, a billiard triangle rack and table brush. Walmart.com now you can get this Majik 3-in-1 Arcade Sport Center Game System for just $31.97 (regularly $62.99). This game system includes basketball, football and baseball activities. It has scoring, real-life sounds and includes 2 basketballs, 1 football and 3 soft baseballs. You can easily switch between double shot hoops and the football or baseball target. Walmart.com now get this EA Sports 60″ Air Powered Hockey Table with Overhead Electronic Scorer for just $89.97 shipped (regularly $150). This air powered hockey table is perfect for a game room in your home or basement. Enjoy some competition with your friends or family at any event, party or gathering. It features a 120V UL certified fan motor for even and consistent air flow! And, it comes with 2 pushers and 2 air hockey pucks. Walmart.com now you can get a 2 Pack of Mainstays Decorative Throw Pillows for just $5 (regularly $10.88). That means you are paying just $2.50 per pillow! Choose free in-store pick up. Walmart.com now get several nice discounts on select toys! Choose free in-store pick up. 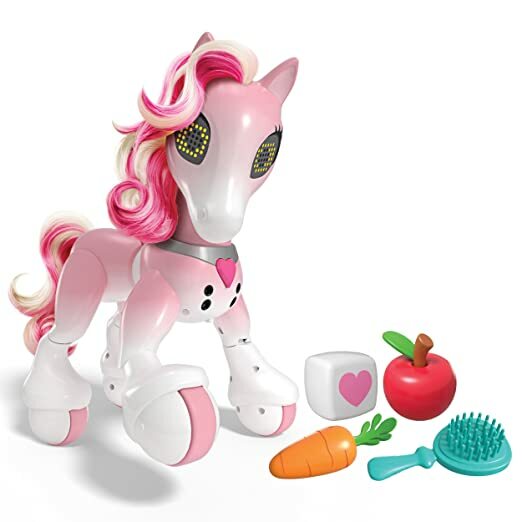 Amazon.com now you can get this interactive Zoomer Fashion Pony with Sounds and Movement for just $39.97 shipped (regularly $79.99). This exclusive pony features rainbow glitter hair, responds to your child’s touch and includes a brush and other accessories. Walmart.com now you can get this Radio Flyer Inchworm Ride-on for only $39.88 shipped (regularly $64.94). This ride-on has an features an ergonomic saddle with a comfort heart handle and an integrated foot rest. It is designed for kiddos ages 2-7 and would be great for outdoor play time. Walmart.com now you can get this Holiday Time Pre-Lit 7′ Duncan Fir Artificial Christmas Tree for only $54.99 shipped (regularly $89)! This tree is easy to set up and has 550 lights already on it. Plus, it comes with the tree stand! Walmart.com now you can get this Ozark Trail Convertible Bench for just $19.97 (regularly $34)! Choose free in-store pick up. This 4 panel bench has four pockets, four cup holders and the backrests can be folded down to make a table. These are great for sporting events and camping! Walmart.com now you can buy this PJ Masks Rival Racers Track Set for only $14.97 (regularly $39.99)! Free in-store pickup. This set lets kids zoom through the raceway to save the Museum from Night Ninja (includes two built in mega launchers, Luna Girl, Catboy figure, Cat-Car vehicle and Night Ninja Bus). Walmart.com where they are offering several nice deals on Women’s Coats! On Walmart.com you can now buy this Women’s Hooded Arctic Fleece Soft Shell Jacket for just $7.50 (regularly $22.96)! Choose free in-store pick up. This jacket comes in three colors and has a drawstring at the bottom to keep the wind and cold air out. On Walmart.com you can now buy this Dynacraft Avengers 12V 4X4 Ride-On for only $159 shipped (regularly $299.99). This two seat ride-on toy operates in forward and reverse with a maximum speed of 5 MPH and comes with adjustable play seat belts. It has functional roll bar lights and fog lights and a removable Captain America Shield. On Walmart.com you can now save up to 60% off Russell men’s activewear. On Walmart.com you can now get this ESPN 54-inch Foosball Soccer Table for just $60 shipped (regularly $119.99)! This full-size table features 26 robot-style players and includes two balls so you can start playing right away! It has classic bead scoring and sturdy legs with additional support. This vehicle is designed for any terrain as it is equipped with pontoons sporting corkscrew shaped treads rather than wheels so it can ride in snow, water, dirt, or grass (batteries are included). On Walmart.com you can now get this Sky Viper MEBO 2.0 Interactive Robot for just $44.97 shipped (regularly $149.99) – lowest price! This interactive robot can be controlled from anywhere in the house via Wi-Fi and streams real-time video and audio straight to your phone or tablet. Plus, it has a five-axis precision-controlled arm, meaning that your MEBO can actually fetch. On Walmart.com you can now get this Orion 4-Shelf Bookcase in oak for only $17.87 or black for just $18.15 (regularly $35)! These bookcases include four adjustable shelves, a back panel and a built-in protective kick plate. They’d be perfect for your office, living room, or the kids’ room! On Walmart.com you can now get this Haier 6,000 BTUs Air Conditioner in white for only $125 shipped (regularly $156). This unit cools smaller spaces up to 250 square feet and features a 24-hour timer, digital time, 3 fan speeds and a dehumidify function. On Walmart.com where you can now buy this Better Homes & Gardens Crossmill Weathered 4-Drawer Dresser for only $139 (regularly $219)! This farmhouse-style dresser measures 32″ L x 19″ W x 45″ H and comes with a 1-year limited warranty. The four drawers feature metal runners and safety stops.